A Vision by Karim Rashid! 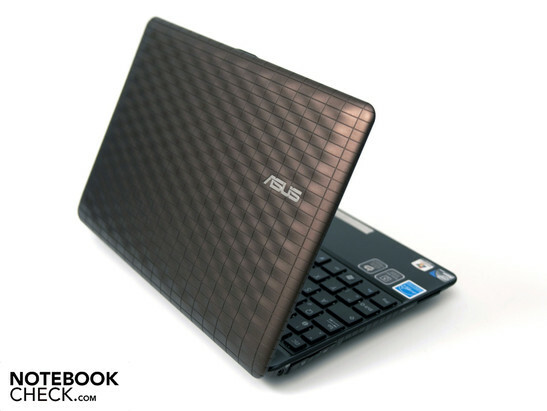 Asus presented yet another 10.1 inch netbook at the Consumer Electronic Show (CES) with its Eee PC 1008P. The most striking innovation is probably the extravagant design by Karim Rashid, a US American designer, who is celebrated as "one of design's brightest stars". Functionality and haptics are to be focused on, whereas the IMR technology (In-Mold Roller) developed by Asus creates a very special coating. The new Eee PC Seashell 1008P has a few interesting features apart from an elegant design. 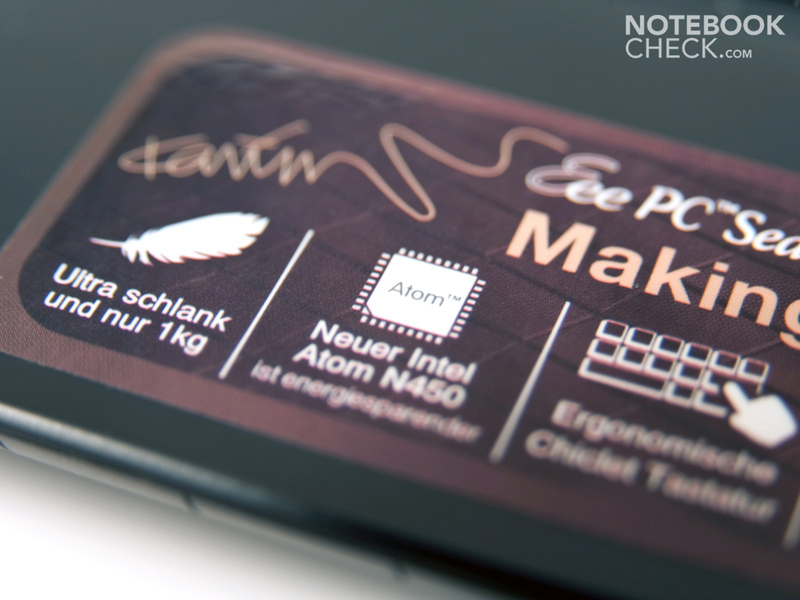 Only a few facts before we start: The new Intel Atom N450 processor with a clock rate of 1.66 GHz does its job inside and makes a longer battery life possible in comparison to the older Atom generations. Furthermore, a 250 GByte hard disk memory from Seagate and a 1 GByte DDR2-800 RAM from A-Data are built-in. In opposition to the Eee PC 1005PE, the 1008P has once again been equipped with a glare type screen. 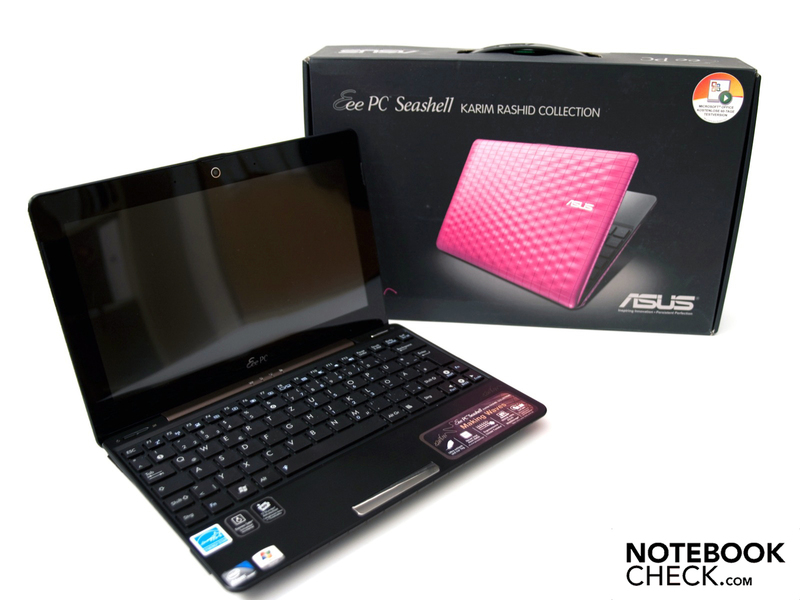 The Asus Eee PC Seashell 1008P designed by Karim Rashid is as of now available in two colors (Hot Pink and Coffee Brown). Asus recommends a price of about 379 euro for the extravagant 10.1 inch device, including VAT. 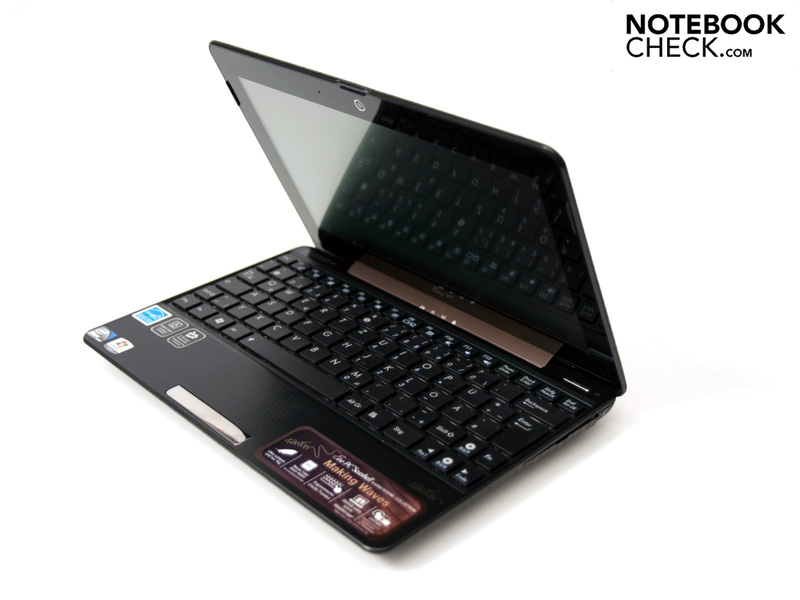 Read about how the Eee PC 1008P manages in detail in our following review. The seashell models are quite a bit more elegant and slimmer in opposition to the first Eee PCs from Asus. The display lid's design is continued around the entire case. 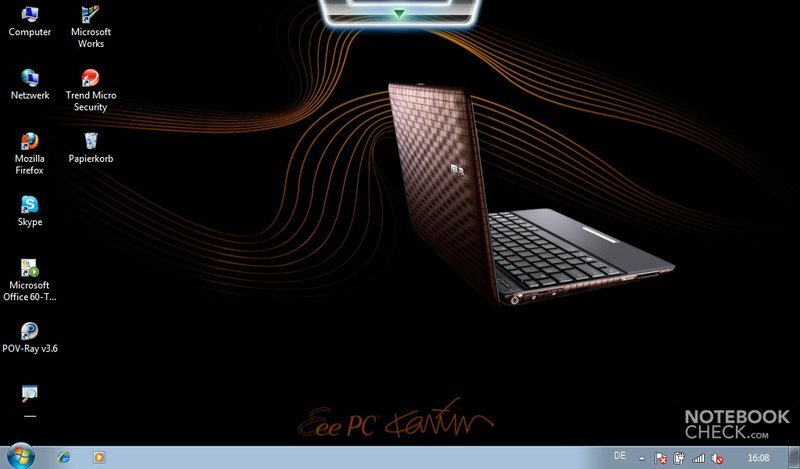 Karim Rashid has dedicated himself to the Asus Eee PC Seashell 1008P. Rashid is seen as "one of design's brightest stars" and has won the renowed red dot award for his product designs four times in series. Karim Rashid puts a special focus on functionality and haptic in his designs and thus, the until now unique wave design for the Eee PC Seashell 1008P had been created. The available colors are just as extraordinary as the design. 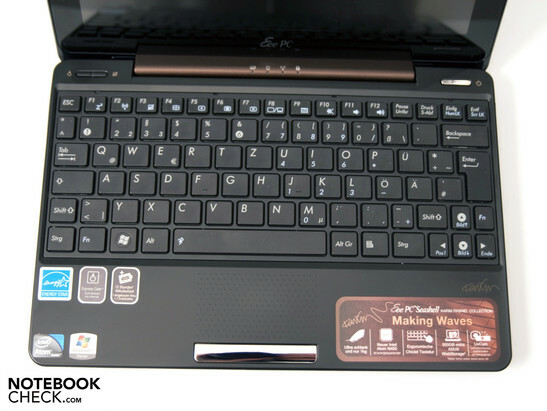 There is a plain dark brown, which Asus has named "Coffee Brown" on the one hand and on the other a very striking and gleaming pink, called "Hot Pink". The wave surface is created by the innovative and specially developed IMR (In-Mold Roller) technology. This technology allows combing a colored and at the same time rubbered surface. A chic and, at the same time, tough case finish is made possible this way. The 1008P also bids a chiclet keyboard, whereby the ergonomics are considerably improved. Typing is supposed to be made easier and more pleasant by the bigger key gaps. The entire design is inspiring and isn't flamboyant. The workmanship makes a very high-end first impression and you don't see any obvious flaws. The case isn't prone for fingerprints because of the matt surface. Merely the "plate" in front of the 10.1 inch display attracts them magically. The case has a good stability despite its slim design. The upper, as well as the bottom side only yields slightly under pressure applied with the hand. The case only deflects noticeably under strong and selective pressure in some places. The display lid isn't very stable and can be twisted easily. Even slight "waves" turn up on the screen when it's moved horizontally. The new 1008P has one big display hinge in the center instead of two single hinges on the left and right. This solution is a bit more stable but not yet perfect because the central hinge has turned out comparatively small. Positioning the display isn't a problem. 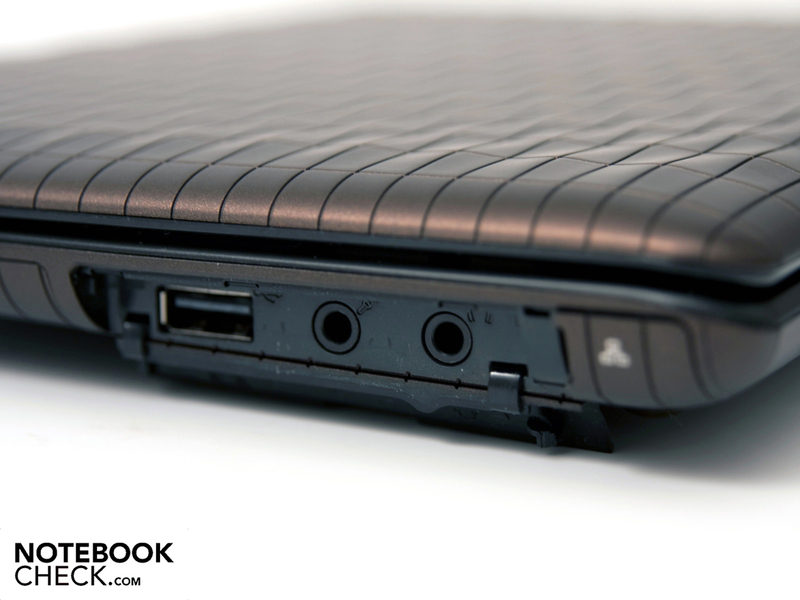 The netbook only weighs 1.14 kilograms (incl. 3 cell battery) at a size of 262 x 180 x 26.2 millimeters (w x d x h). The low weight has one disadvantage, though: the display lid can't be opened without holding the base unit. Unfortunately, the elegant design and slim case doesn't only have advantages. For instance, not as many connections could be accommodated. In this point, Asus has come up with an interesting solution for connecting an external monitor. The connections are elegantly concealed behind covers that merge perfectly with the design. One USB 2.0 port, the DC-in and a mini display port are on the left. Asus supplies a fitting and, at the same time, very small VGA adapter for this port, which is hidden on the case's bottom. Unfortunately, the maximum resolution is restricted to 1400x1050 pixels for external monitors. 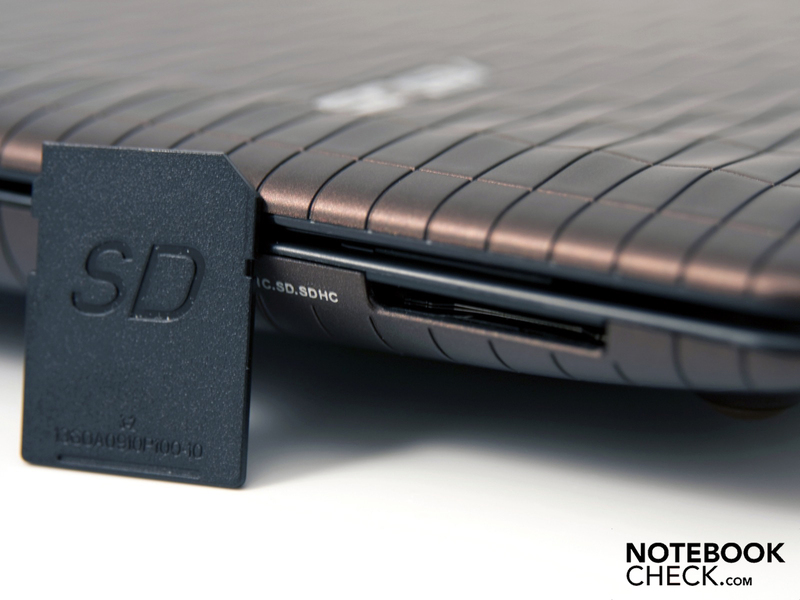 A 2-in-1 cardreader that can read and write SD (SDHC) and MMC memory cards is naturally also onboard. Opposite, on the 1008P's right, a further USB 2.0 port, the audio sockets (headphone-out, microphone-in) and a gigabit-suitable RJ45 network socket (Atheros AR8131 PCI-E Fast Ethernet Controller) are found. 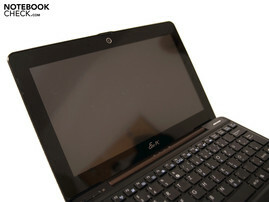 Due to the Eee PC's slim design, the front remains unfettered from any connections. Merely the two small stereo loudspeakers have been placed underneath the front. Even if the rear isn't occupied by a big battery, there aren't any connections there. However, the 1008P has two status LEDs here. These indicate if the netbook is activated and if it's being charged or rather if it's connected to a power source. 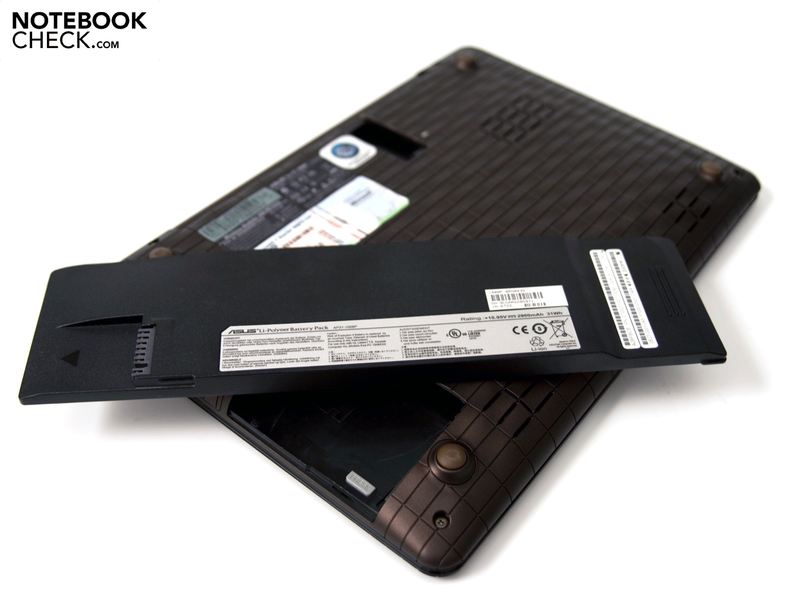 Asus has ingeniously integrated the battery in the bottom of this model. It can be removed after opening a cover on the bottom. Because the space there is very limited, only a 3 cell battery with 2900 mAh is used, but it also allows a very flat design. Asus supplies two of these batteries right away in order to achieve a long battery life, anyway. Asus has done a good job on the port distribution underneath the covers. Even big USB plugs have room despite the limited space. Unfortunately, there are only two USB 2.0 ports built-in, making a USB hub almost compulsory. The 2-in-1 cardreader can't convince because a multi-format cardreader would have been able to offer more. The integrated Intel GMA 3150 graphic restricts the mini display port's maximum external resolution to 1400 x 1050 pixels. Additionally, only an analog signal is sent because Intel's graphic only supports an internal display digitally with a resolution of 1366x768 pixels. Thus, a digital port is looked for in vain. This is simply not intended for the Intel Pine Trail range. However, the image supplied on an external monitor in the maximum resolution was sufficient in terms of definition in the test. 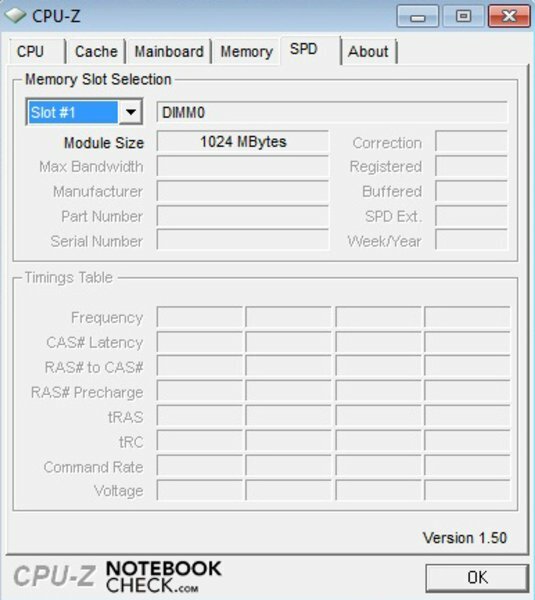 The Eee PC 1008P of course also has an integrated WLAN module, aside from the Atheros AR81831 gigabit Ethernet module. The Atheros AR9285 module supports WLAN standard 802.11 b/g/draft-n. In opposition to the models of the 1005 range, the 1008P has an integrated Bluetooth module over which peripheral devices, such as a keyboard, can be connected. Asus grants a 24 month warranty including pickup & return service on the device. But only 12 months on the battery and adapter. 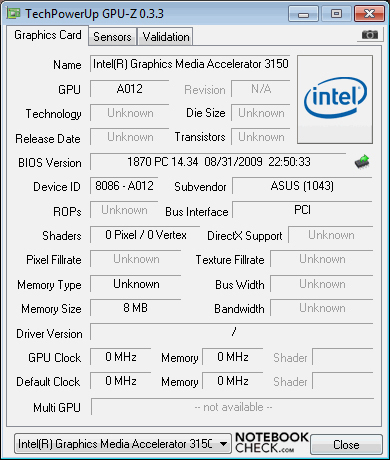 Asus uses Windows 7 Starter in its 32 bit alternative as the operating system. This Windows 7 version only bids the most necessary functions. The other equipment isn't anything special. Adobe Reader 9, the E-Cam camera software, Skype, a 60 day trial version of Microsoft Office 2007 (Excel 2007, OneNote 2007, PowerPoint 2007 and Word 2007) and Trend Micro Internet Security are already preinstalled. 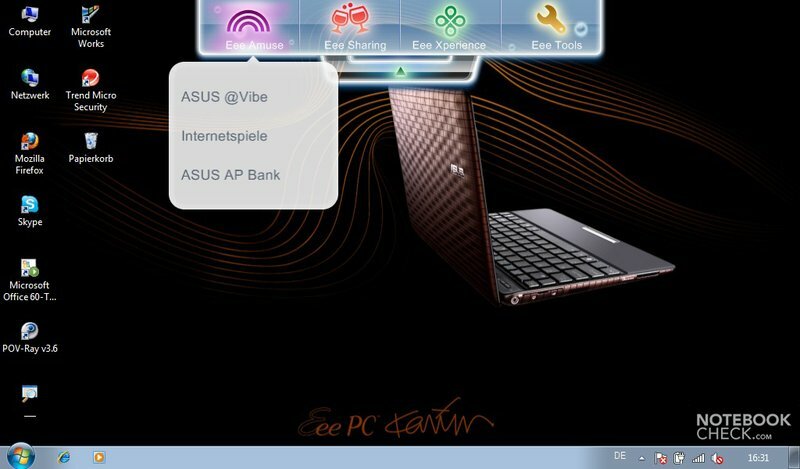 Asus provides a variety of programs for the Eee PC. 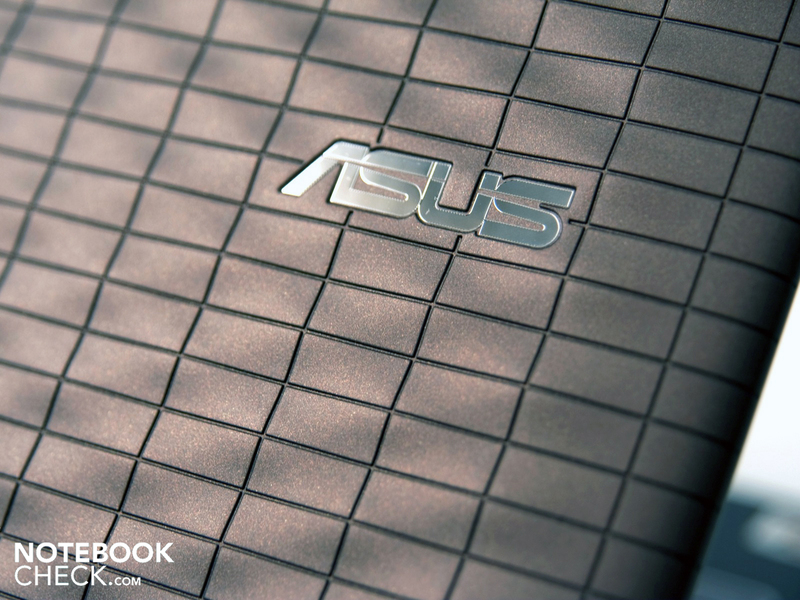 Regrettably, the whole range has been preinstalled by Asus, and has an impact on the booting time. If you install a system builder version of Windows 7 without additional programs and so-called "bloatware", you'll notice a considerable speed difference. 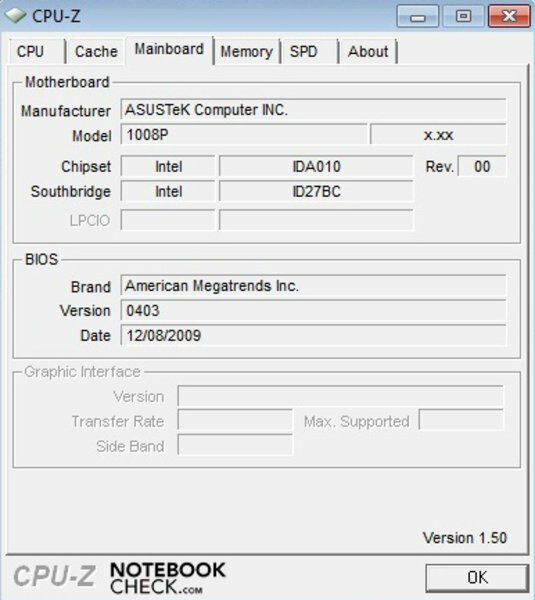 Asus should actually allow the user the freedom to possibly install these programs subsequently if required. 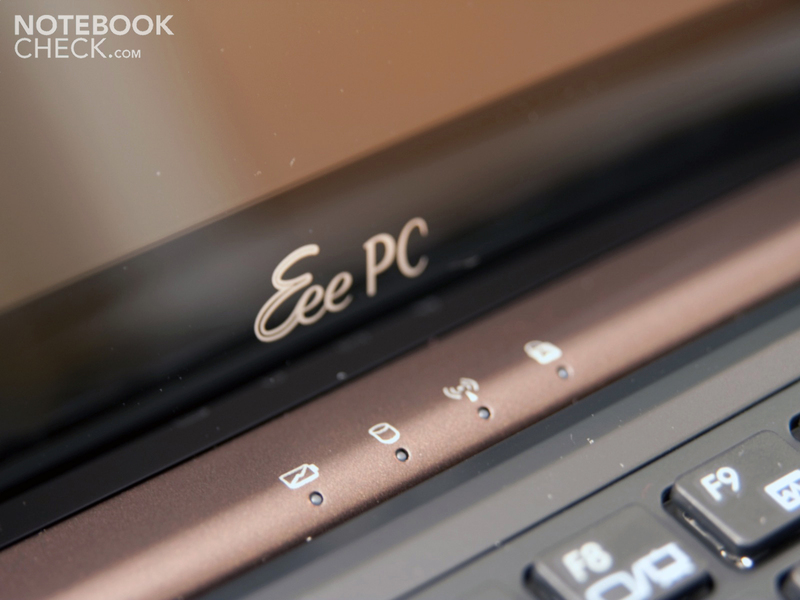 Not only the netbook has received a special design, the Eee PC Seashell 1008P's packaging also looks very elegant. But you won't find any accessories beside the netbook. The scope of delivery includes a black adapter with cable, a support DVD, two batteries, a manual, a quick start guide and a warranty card. The scope of delivery can basically only be called "standard". 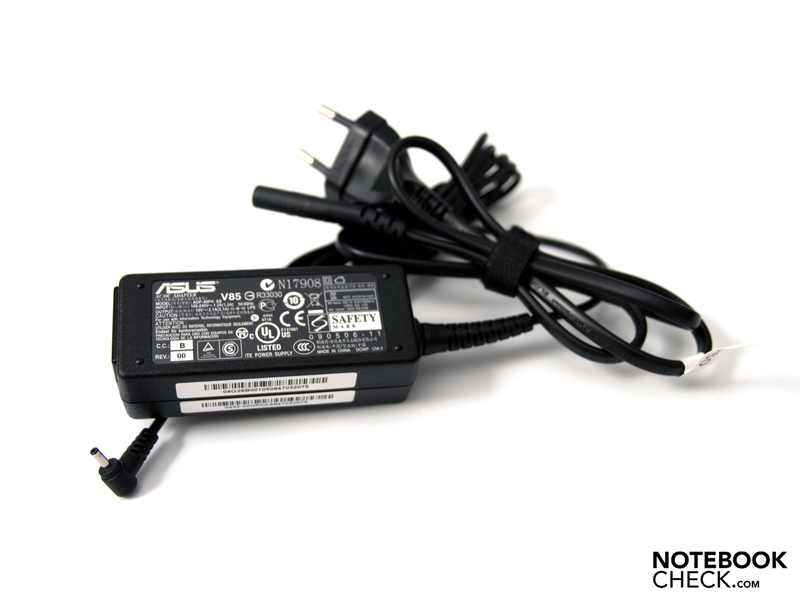 Asus optionally offers the supplies missing in the scope of delivery for a surcharge. For instance, an additional adapter (49 euro, black or white), a protective cover (25 euro), a car charger (39 euro), an optical mouse (29 euro, black or white), a cabled headset (29 euro, black or white), an external 8x DVD Super Multi DL USB drive (79 euro, black or white), a hybrid DVB-T Stick for 69 euro and a warranty extension to 3 years for 89 euro. The keyboard built-in by Asus makes a good first impression. In comparison to the Eee PC 1008HA, a more pleasant chiclet keyboard is now used. This layout is supposed to offer more comfort. The keys have a good pressure point and sit tight in the case. The medium-short stroke length gives enough feedback and bids a good typing feel. The keys are a bit smaller in comparison to common keyboards (16 x 16 millimeters), but because of the distance of 3 millimeters between each key, the risk of typos are diminished. 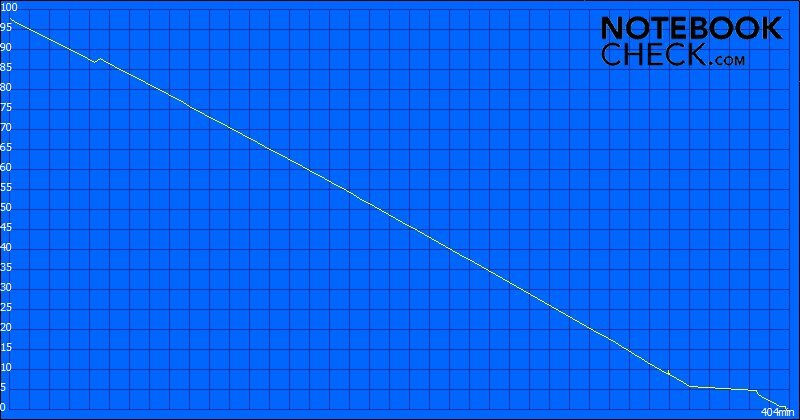 The key grid has a total of 19 x 19 millimeters. The keyboard is kept in a standard layout. The shift keys regrettably turn out comparatively small. Despite that, the layout doesn't prove to be a problem for touch typing after a short accommodation period. A separate numerical block isn't provided due to the case size. The number keys are above the letters. 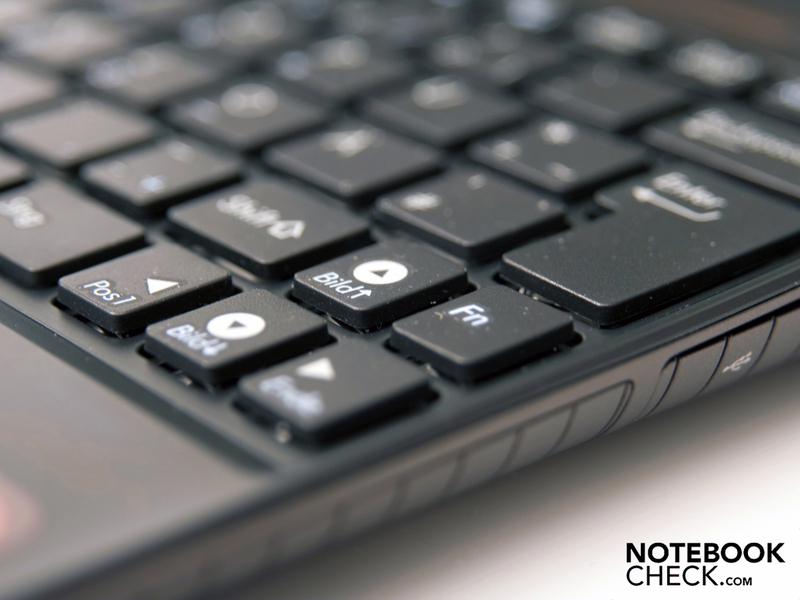 The keyboard's various FN functions are highlighted in a chic light blue and can be addressed via two FN keys. Three hardware buttons are now integrated above the keyboard, and blends in well with the design. The device can be turned on and off with the right button. A button on the left is divided into two functions. 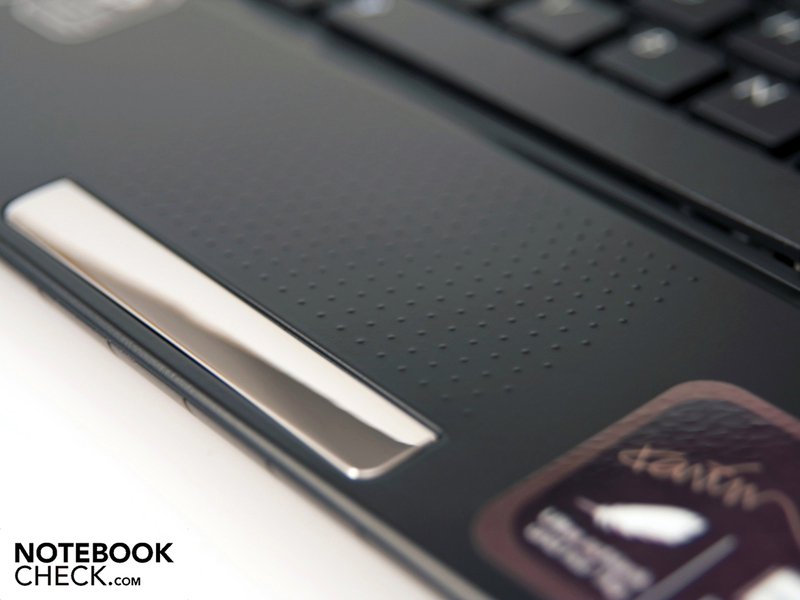 For one thing, the touchpad can be enabled or disabled and for the other, performance profiles (energy savings, high performance, auto high performance and super performance) can be selected under Windows 7. The Express Gate, which makes a fast internet access possible without booting the operating system, can be started over this button when the netbook is deactivated. The touchpad is embedded almost invisibly into the 1008P's matt wrist-rest. Asus has forgone on an extra bezel above the touchpad and has made it only distinguishable by its surface. It has many little knobs that is supposed to also improve the haptics. Subjectively, navigating is easier and more precise, but the surface is, as usual, a matter of preference because it is somewhat rough. 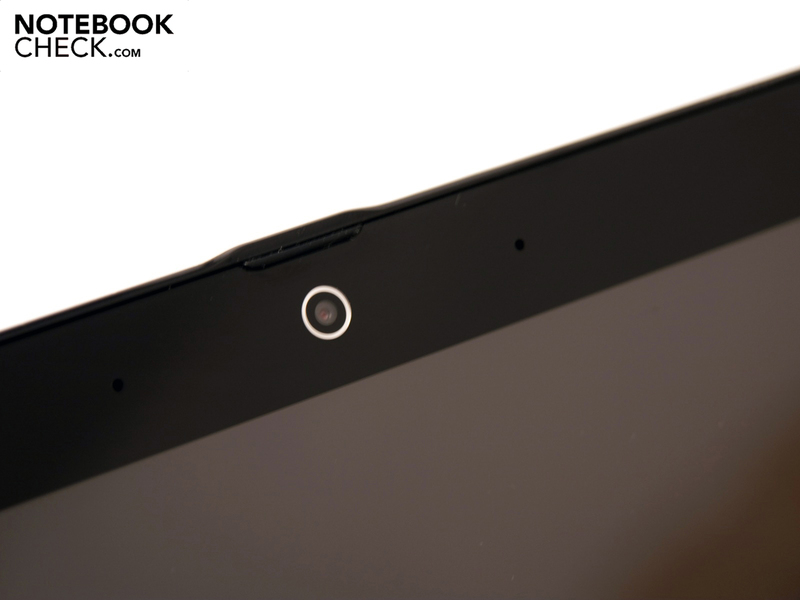 A separate scroll area on the touchpad isn't any longer necessary due to the support of various multi-touch gestures. 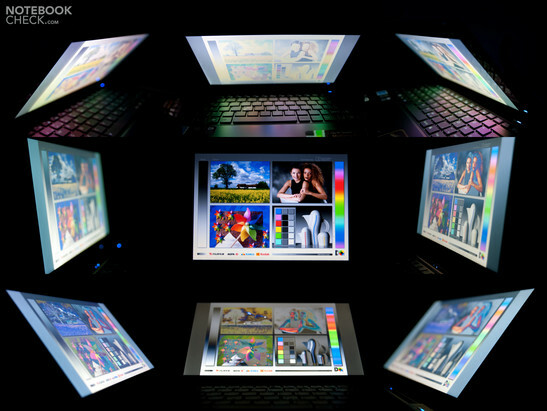 Scrolling, zooming and rotating images is among these functions. The touchpad's setting options are quite circumferential. 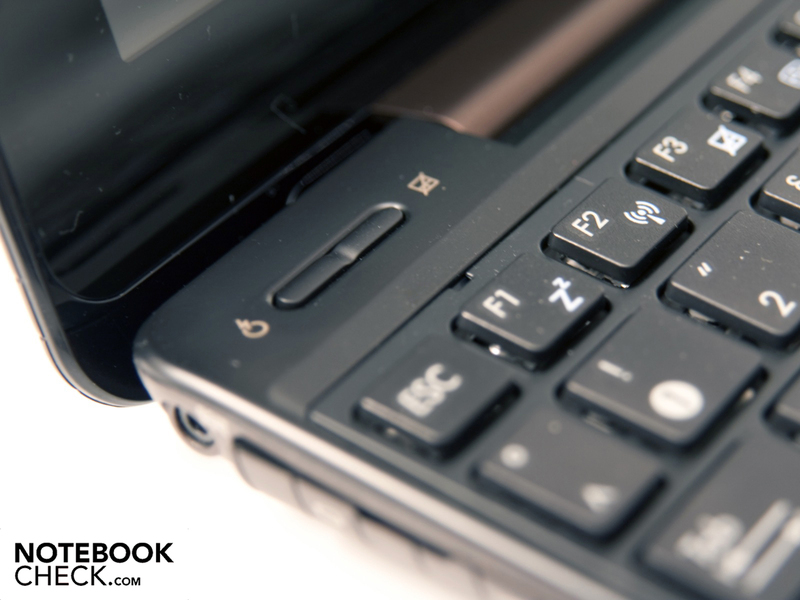 The right and left mouse keys are found directly underneath the touchpad in a chic silver bar. It has an agreeable pressure point and doesn't emit any annoying noises. The 1008P is, alike its colleagues from the 1005 range, equipped with a 10.1 inch screen with an LED backlight. 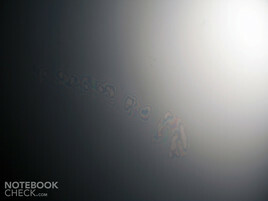 The display is, however, hidden behind a "plate" (edge to edge) and has a glossy surface (glare type). Thus, disagreeable reflections are caused in sunlight or bright light and the content is only hard to recognize. A matt display would have had an advantage. The display has a native resolution of 1024 x 600 pixels, whereas an interpolated resolution of 1024 x 768 pixels under Windows 7 isn't available. An external monitor or LCD TV can be connected as already described over the integrated mini display port, which has been incorporated into the VESA specifications in 2008. The 10.1 inch display makes an overall mediocre first impression. An average to good illumination of 78 percent and the elegant design are on the pro side. A too weak maximum brightness of 109.0 cd/m2 (the average is only 95.7 cd/m2 and a low contrast of just only 163:1 opposes that. It quickly become evident when looking at the Eee PC 1005PE in comparison that the matt display scored much better. A contrast of 874:1 is accomplished there. The brightness is also a bit higher. 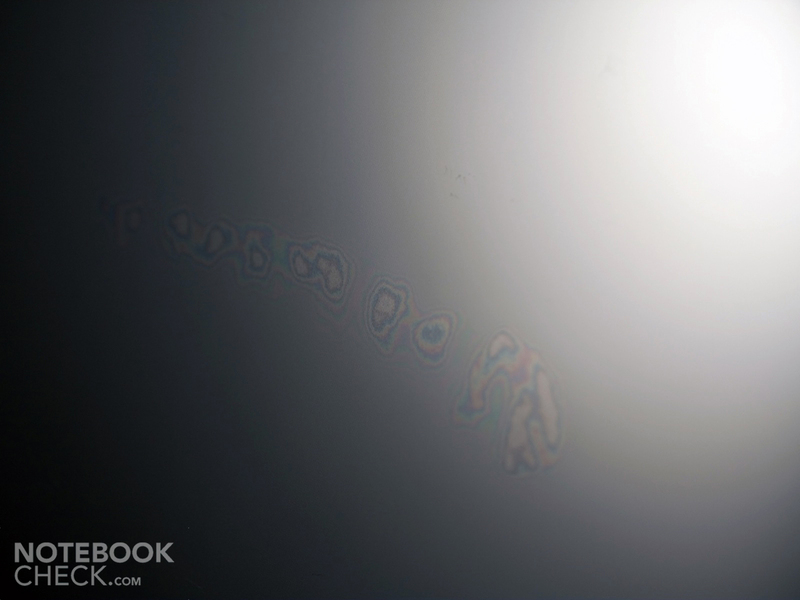 The probably biggest disadvantage for an intended mobile use of the notebook is the display's glare surface. It creates intense reflections and, besides that, leaves marks on the display's glare surface that only disappear slowly after applying pressure. A display brightness modification couldn't be induced with the Eee PC tuning tool, EeeCTL. In a few older Eee PCs a partly higher display brightness could be achieved with this program. The viewing angle stability hasn't changed in comparison to other Eee PCs. Everything is alright on the horizontal plane, but the viewing angles and color fidelity can only be described as more than just average on the vertical plane. Slowly, always more models that use Intel's new Pine Trail range are appearing on the market after the CES in Las Vegas. Thus, an Intel Atom N450 processor with a clock rate of 1.66 GHz now beats in the 1008P. If you only look at the clock rate, you'll find it's identical to that of an Atom N280. The biggest modification is the combination of processor, memory controller and graphic engine (Intel GMA 3150) directly on the chip. This means that the chip set (Intel NM10) can do without these components and Southbridge is unnecessary. This solution only supplies a minimum of additional performance, but at a very noticeable power consumption. Intel's new Atom processors (N450, D410, D510) are manufactured in a cutting-edge 45 nanometer structure width. The new processor and the chip set's thermal design power (TDP) now only add up to 7.5 watts. In comparison, the older N280 processor with an Intel 945GSE chip set has a TDP of 11.8 watts. Aside from the new Pine Trail range components, Asus has built a 1 GByte DDR2-800 RAM from A-Data and a 250 GByte hard disk memory from Seagate into the 1008P. A model with a preinstalled Solid State Drive (SSD) isn't planned. 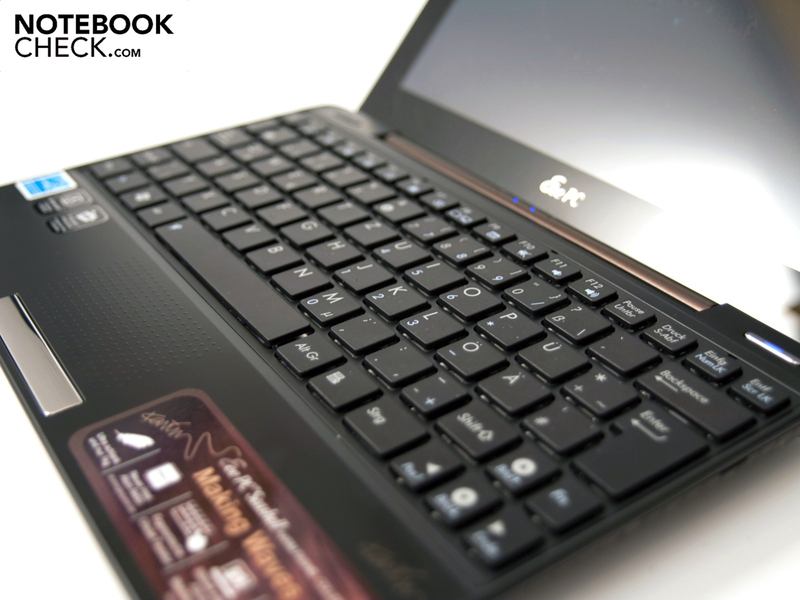 We sent the Eee PC over our benchmark course to assess the its performance rates. All tests have been executed in the super performance profile, whereby the processor bids an overclocked frequency of 1838 MHz. The processor is clocked down to a weak 865 MHz in energy savings mode. First stop was the application benchmark field. The 1008P's "strength" is also found here. 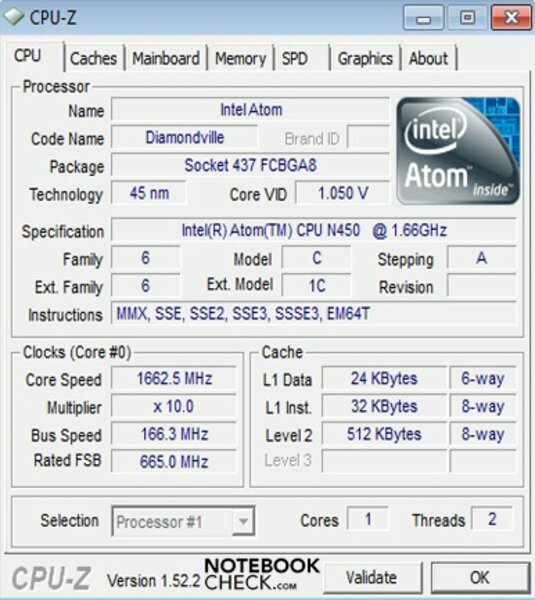 Intel's Atom N450 achieved 591 points in the single-core and 957 points in the multi-core rendering of CineBench R10. Older models with an N280 processor only accomplish slightly fewer points than the current hardware. The difference is only between 10 - 25 points here. 1510 points were reached in PCMark 2005. The Eee PC 1008P can't distinguish itself from its colleagues with an Intel Atom N280 here, either. The elegant netbook obviously doesn't like the synthetic gaming benchmarks at all. It only just achieved 3050 points in 3DMark 2001SE!. Newer versions drive the rates closer and closer to the zero point mark. It's still a meager 158 points in 3DMark06, whereas the processor still can attain 545 points. 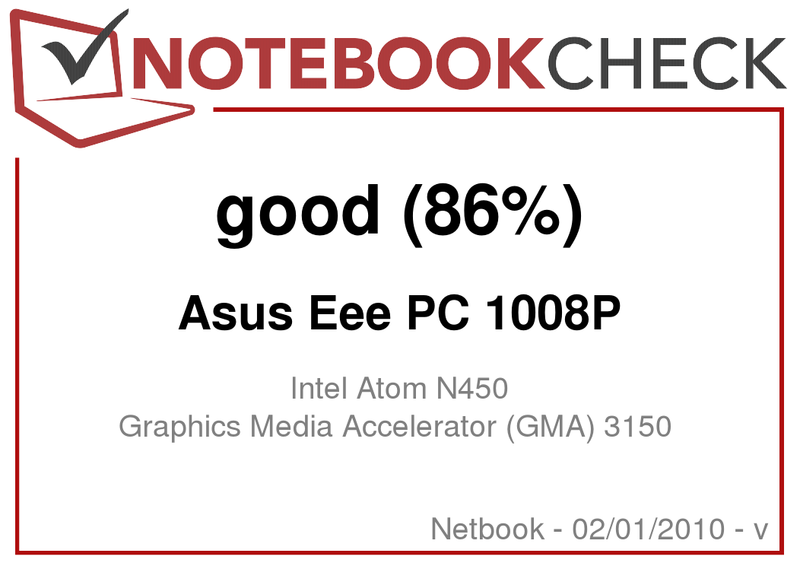 The netbook isn't made for gaming and a performance gain in comparison to Intel's Atom N280 range with a GMA 950 graphic can't be recorded. The N450 can't clearly distinguish itself from its colleagues in SuperPi, WPrime and SiSoftware Sandra, either. The SuperPi 1M calculation took 84 seconds (32M: 4027 seconds) and the WPrime 32M calculation also needed a long 106 seconds (1024M: 3403 seconds). Furthermore, the processor achieved 4643 MIPS and 3874 MFLOPS in the SiSoftware Sandra benchmark test. 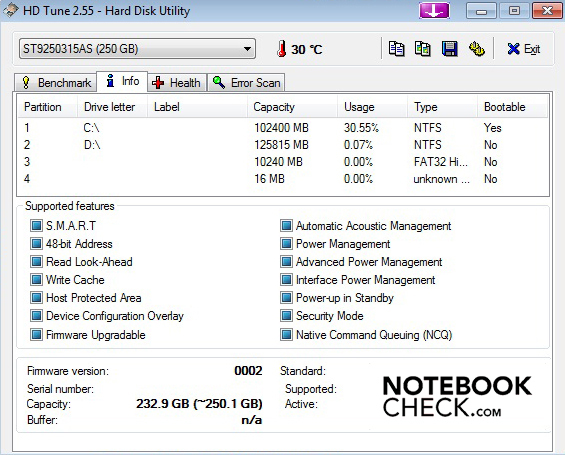 The Seagate Momentus 5400.6 with a 250 hard disk, often used by Asus, is also built into the 1008P. 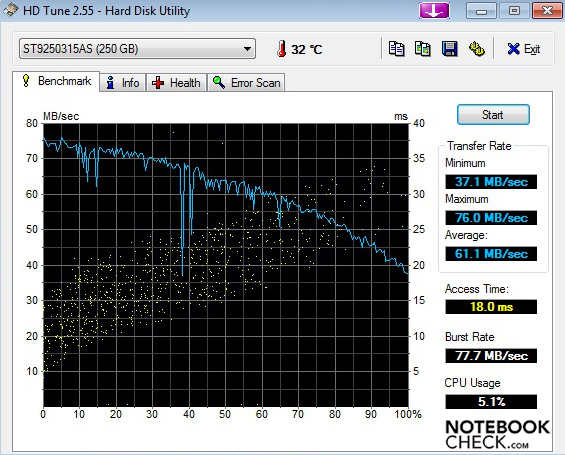 The eSATA hard disk ran through the HDTune benchmark with good rates. The transfer rates are between 31.1 and 76.0 MBytes per second. The average is 61.1 MBytes. The access rate of 18.0 milliseconds is still within a normal field and the throughput rate of 77.7 MBytes per second is also within a limit. 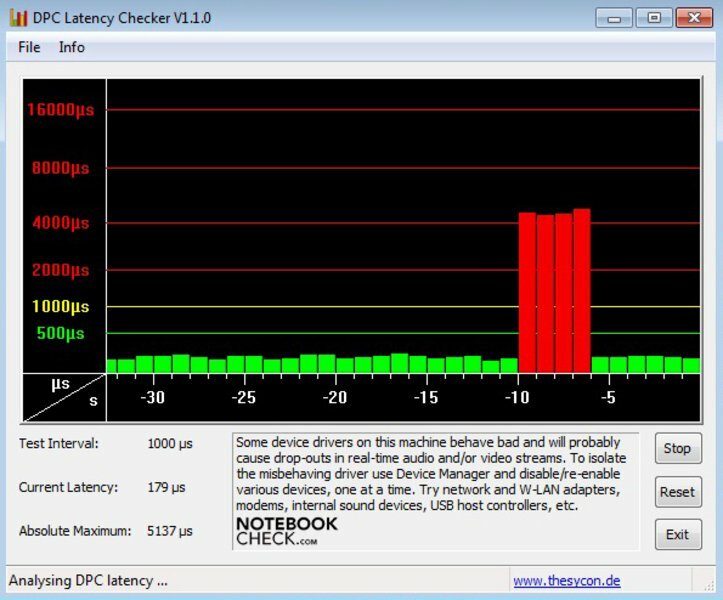 We checked the 1008P's latencies under Windows 7 with the DPC Latency Checker. If these are too high, it can come to problems when peripheral devices are connected. The most frequent problem is a sound crackling with external sound cards. The majority of rates remained under 500µs, but there are, unfortunately, a few rates that exceed 1000µs for a short time. This could, therefore, cause problems. Flash videos are also not one of the new Pine Trail range's strengths without an additional chip. Normal videos on YouTube don't cause any problems. 720p videos still run fairly smooth with a few interruptions and 1080p material only runs as a freeze frame slide show. Newer games can only be played either unsatisfactorily up to not at all. Gaming is only possible in the lowest resolution and without details, but isn't really fun. Precise details about the new Intel Pine Trail range's HD rendering and gaming performance can be read in our comprehensive review of Asus' Eee PC 1005PE. A small fan does its job inside of the netbook and its volume is within limits. The warm air escapes over a small opening on the bottom. 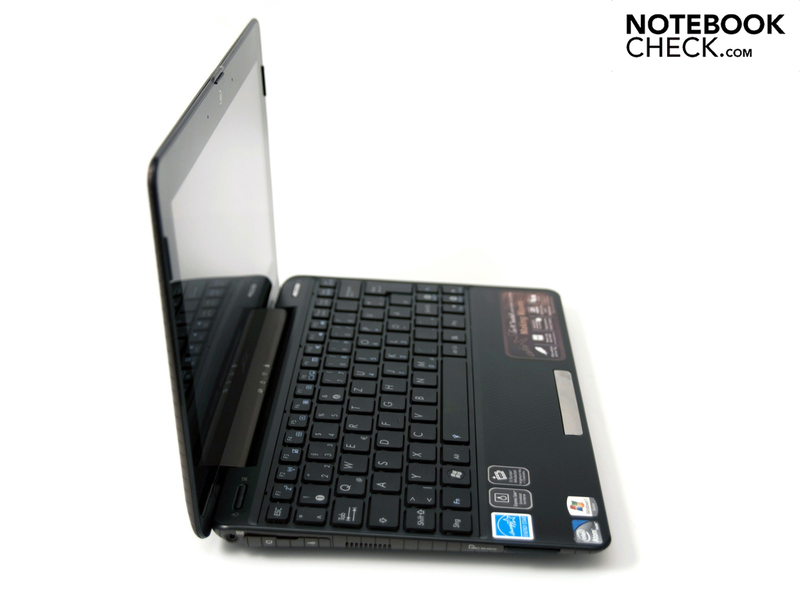 The Eee PC 1008P operates almost silently in normal use. We measured rates between 29.2 dB(A) and 29.7 dB(A) in routine use. You'll barely ever notice the netbook in this case. The built-in Seagate Momentus 5400.6 with a 250 GByte memory emits a maximum of 29.6 dB(A). In return, the fan can be very evidently distinguished under load. We could establish a maximum of 36.9 dB(A) under 3D and CPU load. Generally, the noise level isn't disturbing in normal use and the load case will barely ever turn up in practice, anyway. The rates we measured left an average to good impression. We executed all measurements at a constant room temperature of 22.5 degrees Celsius. The temperatures on the case's upper side are within an acceptable field, even if slightly elevated. We could assess a maximum rate of 34.9 degrees Celsius in normal use with low fan activity. Fortunately, the warmest area isn't in the wrist-rest vicinity. The temperatures are elevated on the bottom in some places. We could establish a maximum of 44.7 degrees Celsius in the rear area after one hour of load. The air escapes over only two little openings on the bottom, whereby increased temperatures, especially at use on the lap, could develop. (+) In idle usage, the average temperature for the upper side is 30.6 °C / 87 F, compared to the device average of 29.8 °C / 86 F.
Acer has integrated the stereo loudspeakers unobtrusively on the bottom front. The 1008P's speakers aren't impressive. They develop a high volume that isn't a pleasure as the deep pitches and basses are non-existent and the high pitches come to the fore too obtrusively. The sound makes a very artificial and tinny impression due to this unfavorable constellation. You should use external loudspeakers or good headphones here as well, as the integrated 3.5 millimeter socket bids a better sound. The biggest advantage of Intel's new Pine Trail range with an Atom N450 processor, GMA 3150 graphics and NM10 chip set is probably the low power consumption and the therewith resulting long battery life. The predecessor (Atom N280) with a 945GSE chip set has a maximum power draw (TDP) of 11.8 watts. The new range only has 7.5 watts in comparison. What impact does the theoretical difference of 4.3 watts have? One special feature of the 1008P are the two included batteries. 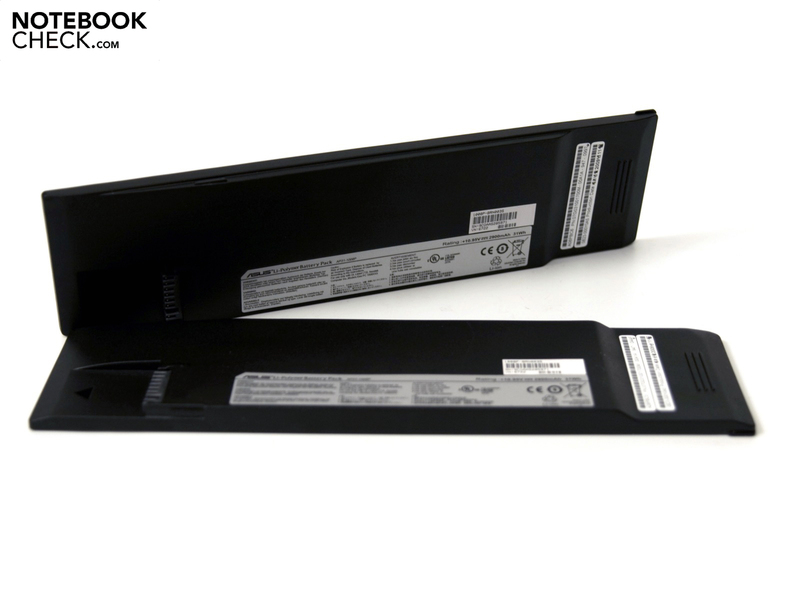 Because the case design doesn't permit a big 6 cell battery, Asus uses two long, but very thin 3 cell batteries with 2900 mAh or 31 Wh (10.95 volts) each. We doubled the following results of the 3 cell battery for the ratings. This idea from Asus preconditions that you have the second battery by you and that the netbook is rebooted after the battery change. As usual, we sent the 1008P through 3 different tests, in which we measured the maximum and minimum battery life as well as the runtime in only WLAN use. 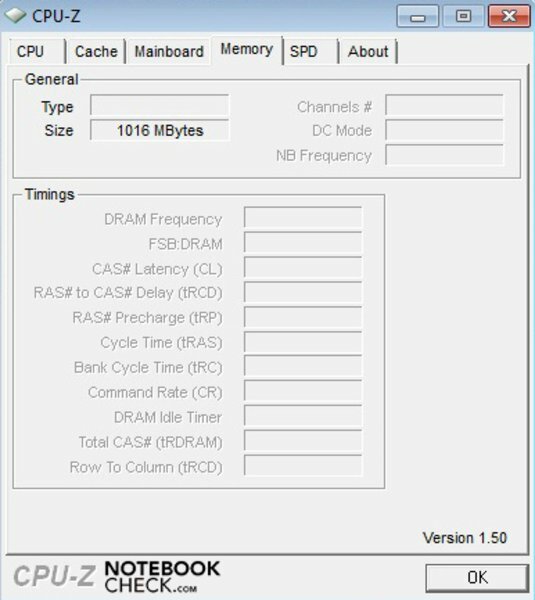 The "Classic Test" from Battery Eater establishes the minimum runtime. We enabled the maximum display brightness, the super performance profile and WLAN for this. The 1008P ultimately turned itself off after exactly 2 hours and 54 minutes. We used the high performance profile for the next test, a medium brightness level and enabled WLAN in order to establish the runtime in only WLAN use. We recorded a good time of 5 hours and 31 minutes (more than 11 hours with both batteries) in this case. This runtime already exceeds a normal working day in the office. We reduced the display's brightness, selected the energy savings profile and disabled WLAN for the "Readers Test". 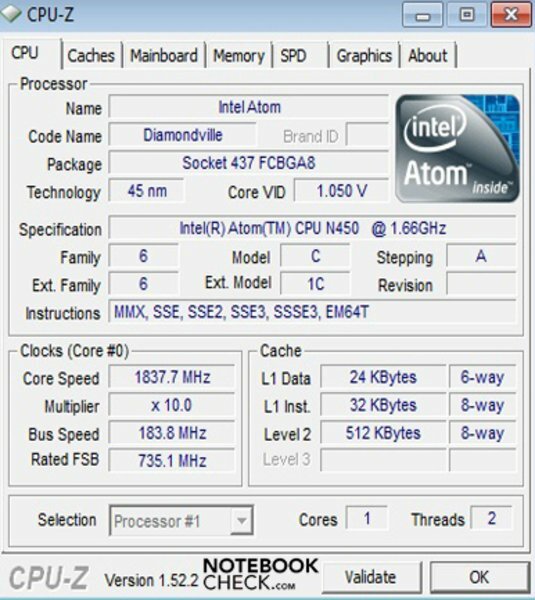 The Intel Atom N450's clock rate is throttled to a weak 865 MHz due to that. The battery first reached its performance limit after an astonishing 6 hours and 44 minutes. Therewith, the 1008P surpassed Asus' stated battery life of up to about 12 hours (with both batteries) considerably. The power consumption remains with 6.8 - 7.9 watts in idle mode and 11.2 - 13.5 watts under full load in a green field. 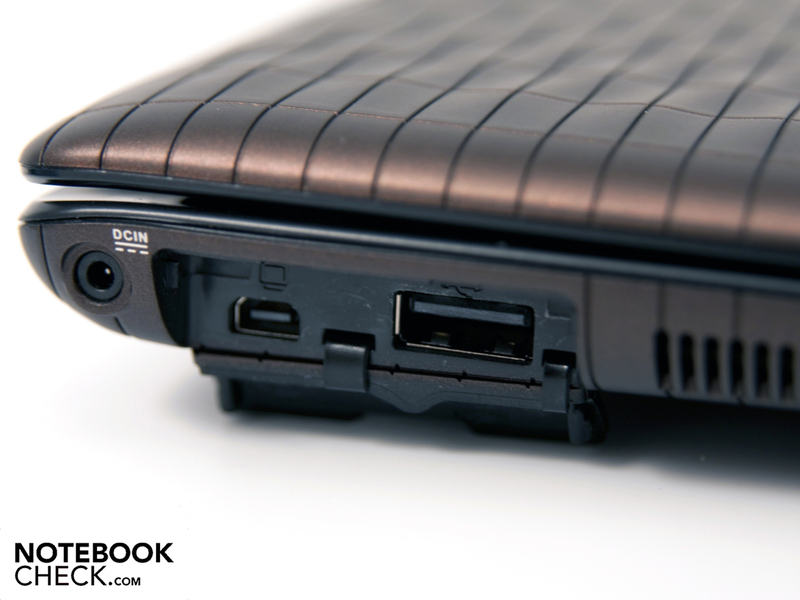 The comparable Asus Eee PC 1005PE consumes even less electricity with the same hardware configuration. We established 0.0 watts in both a deactivated state and in standby. Those are overall very good rates for a 10.1 inch netbook. Intel's Pine Trail range can score again in this regard. The elegant Asus Eee PC Seashell 1008P by Karim Rashid could mainly convince us. However there are also a few deductions to be made. The increased battery life and at the same time lower power consumption are very positive and the manufacturer's data for the maximum battery runtime from Asus of 13 hours and 28 minutes was surpassed. We've rewarded it with the whole 100 percent for this long battery life in our rating. We still have a straight 95 percent even if only one battery's runtime is looked at. There's nothing special about the configuration. Aside from the new processor, a 1 GByte RAM and a 250 GByte hard disk memory has been built-in. We couldn't establish a significant performance difference to Intel's old Atom N280 with an Intel GMA 950 graphic. Several simultaneously running programs and windows still cause problems. Only a 2 core Atom processor, such as the N330 or D510, would probably be able to solve that. The connectivity has, unfortunately, been reduced. There are only just two USB ports built-in and we still miss a multi-format cardreader. However, the integrated mini display port with included VGA adapter is interesting. 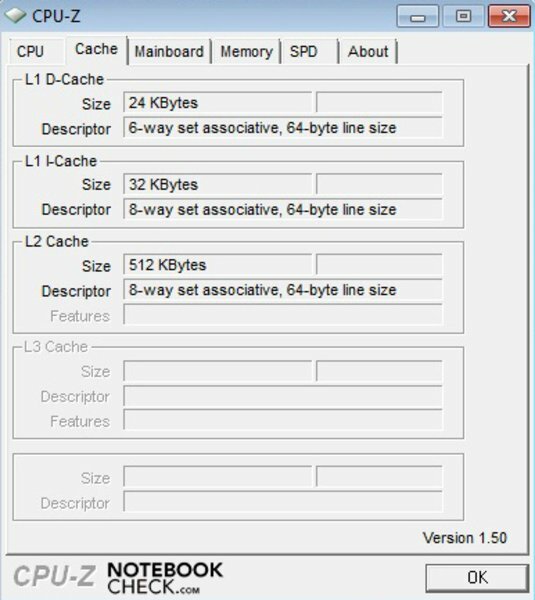 If Intel's GMA 3150 graphics didn't limit the resolution, it would be a perfect solution for slim notebooks. The glare type display can't score and is beaten by its matt colleagues by lengths. The "plate" put in front of it looks great but leaves ugly marks on the screen and annoys with reflections in adverse light conditions. The chiclet keyboard is winning and only the shift key that turns out a bit too small dampen the picture. The noise and heat development are within an acceptable range, at least in practical use. The touchpad still has a somewhat rough surface but the multi-touch gestures have improved in the meantime. The solution of two slim batteries is especially beneficial for the travelling weight, however you have to carry the second 3 cell battery around for a long battery life. The bottom line is that Asus' Eee PC Seashell 1008P, designed by the star-designer Karim Rashid, is a good netbook with many pros but also a few cons. Intel's new Pine Trail range is a step in the right direction. We would welcome such battery runtimes paired with smooth HD rendering for the future. 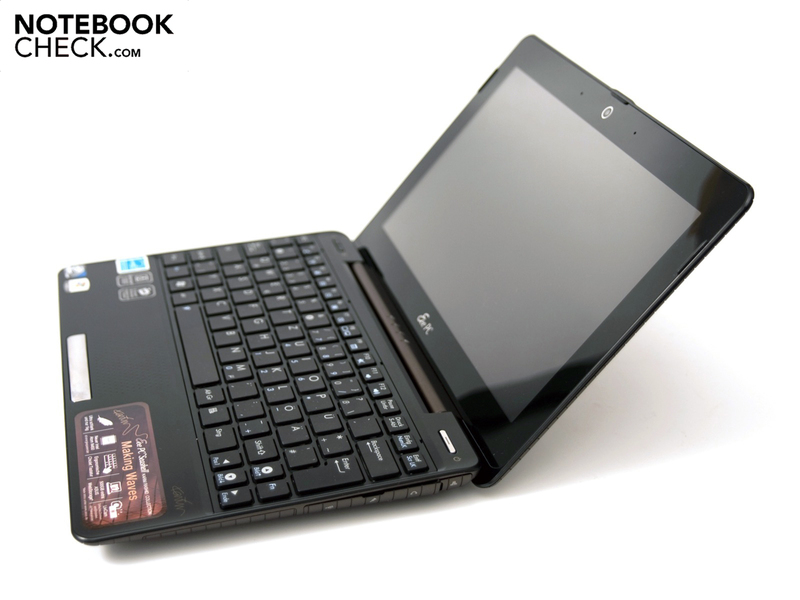 The netbooks is now available for 379 euro (MSRP) in two chic colors. The very chic and robust wave design by Karim Rashid in extravagant colors, the extremely long battery life and the ergonomic chiclet keyboard. 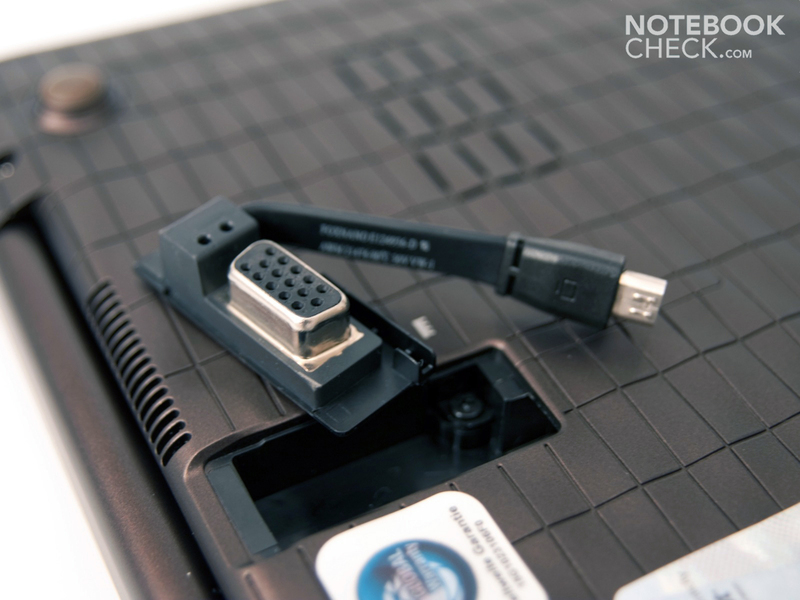 A better, in particular brighter, display, a few additional connections, such as more USB connections or a multi-format cardreader. The battery change concept. The good battery life paired with the low weight and the slim design. All current netbooks with a 10.1 inch screen based on Intel's new Pine Trail range. 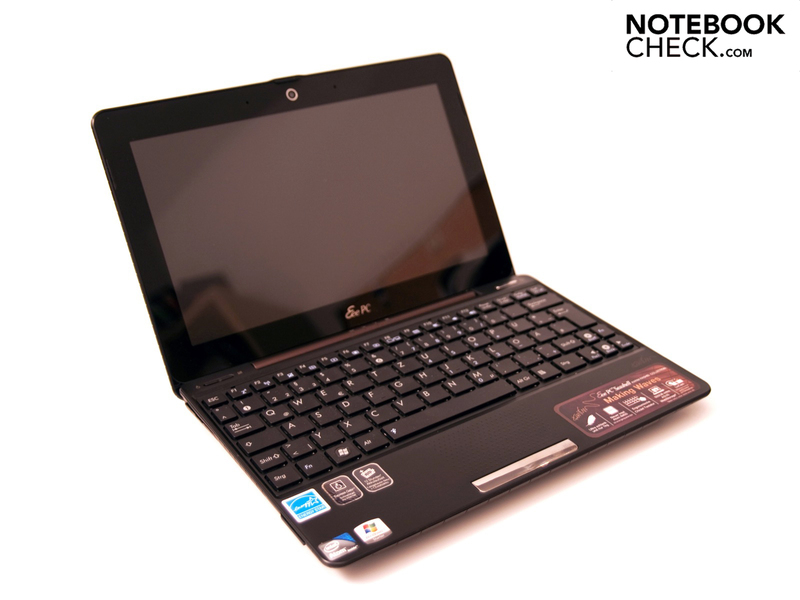 For example, among others, Asus' Eee PC 1005PE, Dell's Mini 10, MSI's Wind U135 or Acer's Aspire One 532 netbook.